Ratatouille! One of my favorite Disney movies before. This isn’t a classic ratatouille, which is a traditional French vegetable stew. But it reminded me of the one on the movie, with its pretty layers of vegetables. And with the puff pastry and fresh tomatoes and cheese, it’s kind of like a vegetable pizza. 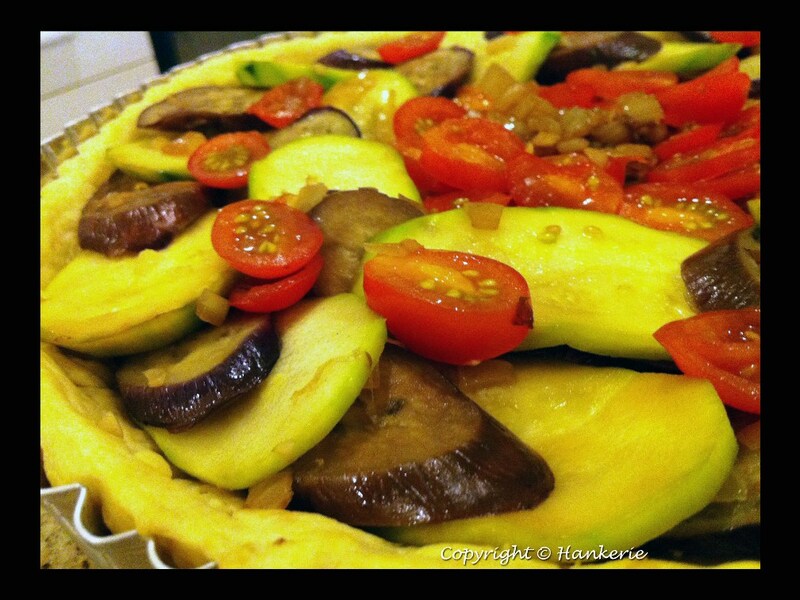 An incredibly tasty vegetable pizza (I even ate all the egg plants and zucchini). This recipe is really pretty simple to make! If you're lazy to make your own crust, you may just grab the ready made crust from store. Put the flour, butter, salt and 3 tablespoons cold water in the food processor (or by hand) and pulse them until a ball of dough is formed. Remove dough from bowl and wrap it in plastic wrap. Put in refrigerator at least 30 minutes. Sprinkle the table with flour and stretch the dough until it's big enough to cover the tart tray Place the dough in the tray, pressing well on the edge to obtain a nice shape. With a fork pierce the bottom of the crust from place to place. Bake the crust 15 minutes. Slice all vegetables. Heat a little oil and fry the eggplant and zucchini slices on both sides until slightly softened. Put them in the half baked tart crust. 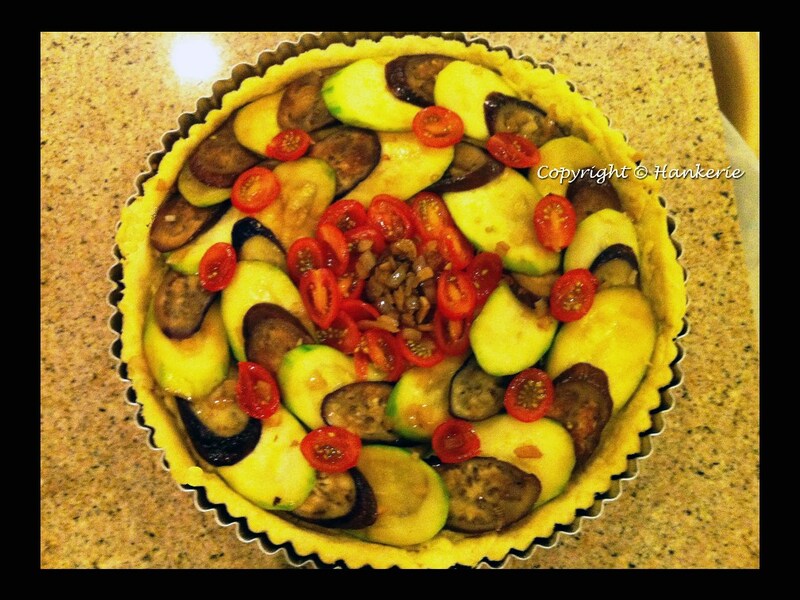 Place alternating slices of vegetables, eggplant, zucchini, onions, Cherries tomatoes. Sprinkle black pepper. Add Mozzarella cheese. Allow tart to cool slightly (10 minutes) in the pan, then remove, to cool completely. I am submitting this to Aspiring Bakers #10: Easy as Pie (August 2011), hosted by Janine of Not the Kitchen Sink!" Wow, this is so colourful and sure it's a healthy meal! As much as it looks interestingly healthy, honestly I'm very reluctant to try because it contains the very item I don't like - eggplants! Will it be slimy/mushy when cooked?? "Mad" about Macarons - Successful!